« The best BIOS support team on the internet is here, welcome. The HP MediaSmart Server is a versatile OEM Windows Home Server Version 1 product, and is well known for its low power consumption and small form factor. Several months ago, BIOS-Mods helped several other developers compile a BIOS image that would enable true dual core and quadcore CPU support for the EX485 platform to have similar if not better performance than the emerging EX495. After many successful upgrades without BIOS modification, it was established that there were several issues with sleep and shutdown with the “R0” revision Intel CPUs. The modding then plunged onward with flashing the EX495 BIOS to the EX485. This was very successful, except there was an incompatibility with the fan speeds and it was determined it would not be a suitable solution. After another few attempts, a bad image was produced and indeed “bricked” the MediaSmart server at BIOS-Mods. Several other owners were also affected. For anyone who wishes to recover from a bricked BIOS on their Mediasmart after a bad flash, BIOS-Mods now has a proven method for BIOS recovery. Please note if you are testing images for RAID or CPU support, it is reccomended that you always preserve the bootblock, which the recovery method relies upon. 1. Download the original EX485 BIOS image for your server here. 3. Insert the USB drive into the bottom port on the back of the server. 4. When the server is plugged in, start the server and quickly hold down the recovery button on the server for approximately 5 seconds. The recovery light will then start to flash an aqua to white color. During this time, press Ctrl + Home on your keyboard (USB keyboard, or PS2 keyboard with the adapter, try both to ensure the keystroke is sent). and hold for 3 seconds. Then, your flash drive light activity will flash for a few moments, and your server will reboot automatically with the restored EX485 BIOS. Now that BIOS-Mods has had a successful recovery procedure developed for the MediaSmart server, stay tuned for RAID5 and CPU support enhancements. I just finished the guide over at tom’s hardware and now my mediasmart is running an X2 processor. I would love to know more about bios modification, and how it could benefit the mediasmart! The MSS is not that “versatile”. No native KVM capabilities and not easily upgraded. 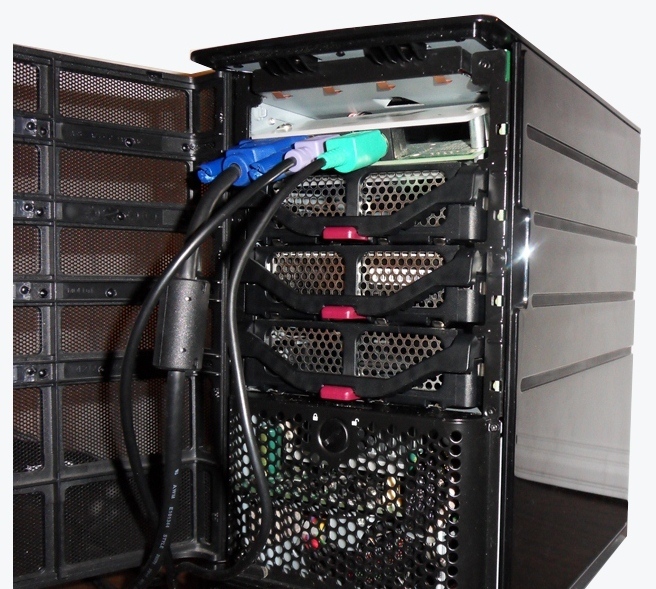 Has anyone ever fitted the case with an off-the-shelf motherboard with integrated graphics?